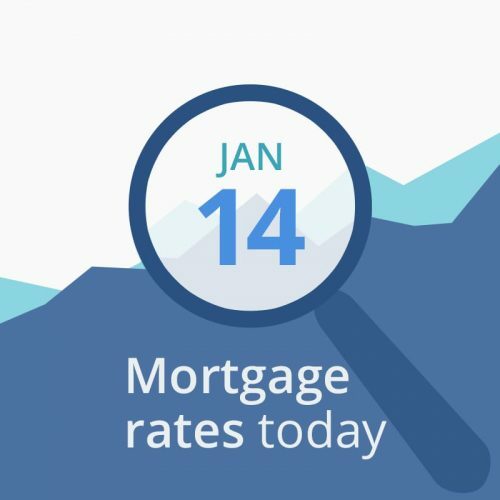 Average mortgage rates today are nearly unchanged from Friday morning’s. As is typical for Mondays, there are no scheduled economic reports this morning. Investors, lenders and borrowers will have to set their interest rates and make their lock/float decisions based on political news and the financial data listed below the rate table. The news is currently neutral, but markets are unstable and participants are skittish. Borrowers did get some good news today; the IRS announced that it will resume providing income verification for mortgage lenders, allowing mortgages to close and fund after being held up since December 21. In addition, FEMA has resumed issuing flood insurance policies, relieving another bottleneck for borrowers created by the government shutdown. This morning’s data are neutral-to-good for mortgage rates. CNNMoney’s Fear & Greed Index edged lower by 1 point to 29 (out of a possible 100). That score is in the “fear” range. The direction of movement is good for rates. “Greedy” investors push bond prices down (and interest rates up) as they leave the bond market and move into stocks, while “fearful” investors do the opposite. This week is light on economic releases, and mortgage rates will likely moved based on political happenings, such as the ongoing government shutdown, trade war with China, and negotiations with Congress over the federal budget and the proposed border wall.